To make up for his error, Auri-El led the original Aldmer against the armies of Lorkhan in mythic times, vanquishing him and establishing the first kingdoms of the Altmer, Altmora and Old Ehlnofey. Auriel's Bow and Auriel's Shield were allegedly created by Anuiel to be used by Auri-El against Lorkhan's hordes. Though Altmora was retaken by men and Old Ehlnofey was sundered, Auri-El's greatest knight, Trinimac (who, in some places, was even more popular than Auri-El), succeeded in defeating Lorkhan, and Auri-El hid his Heart by attaching it to an arrow and sending it far into the sea. Later, Auri-El ascended to heaven in full observance of his followers so that they might learn the steps needed to escape the mortal plane. ^ Auri-El was evidently a prominent figure in the Ayleid religion. In the TES IV: Oblivion quest Secrets of the Ayleids, the Altmer Umbacano gains access to an Ayleid throne by reciting "Av Auri-El ye Tamri-El dellevoy an Arpen Aran tarnabye! ", which means "By Auriel and Tamriel, grant [imperative] [the] Noble [ie, True] King passage." 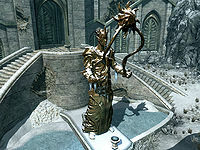 In the Dawnguard expansion for TES V: Skyrim, Serana notes that the statue of Auri-El outside the Inner Sanctum of the Chantry of Auri-El incorporates the "older signs" of his power. Esta página foi modificada pela última vez à(s) 23h31min de 27 de setembro de 2014.